Those who love Samick Sage and want the same quality traditional bow for his/her child Samick Polaris bow 62’’ takedown recurve bow is the right choice for them. Draw weights of Polaris started at 15# which is perfectly all right for the beginner’s, on the other hand, it support hunters with 40# one. Regarding the budget, it is a bit lower than the Sage, so if you want to start archery as a newbie, the Polaris Youth is a perfect setting for you. 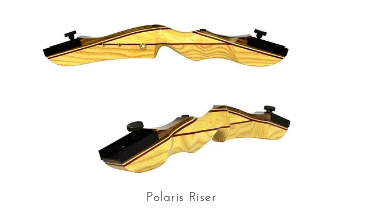 The riser of the Samick Polaris bow is visually very appealing. It made of different kind of woods like walnut, white oak, olive dymondwood or hard maple laminations. The stripes of brown and beige lumber and a red one in the middle in the riser brings the aesthetical looks in it. The riser equipped with a cut past the center with a crown arrow shelf. A shelf that's cut past the center of riser helps to erase the effects of what's called the archer's paradox. On a cut-past center, the arrow sits in an angel with the string and because of this angel string push the arrows forward. Besides the forward speed, there is a side flex which found due to a little force created by a string. If the angle between the center and string increase, the arrow flex also increasing in the same ration which is not acceptable for accurate shooting. So with the shelf with a cut past center, will help you to get the angle pretty close to zero, yielding better efficiency. The riser also come up with the predrilled brush bushing which allows you to set stabilizer, quiver/sight and or plunger. The limbs of Polaris Recurve Bow covered with white fiberglass and highlighted finish. It constructed with hard maple combined with white fiberglass which has a metal limb pocket and single tapered knob. It is durable enough for rough use by children or learner archer. Due to the single tapered knob, it is easy to take down and carry along with you wherever required. Also, you can interchange the limbs for an upgrade or change white color with a black one with Samick Sage. So, once you started with lower poundage, it will allow you to increase draw weight in future which is a cost-effective option for you. However, most of the bowman use this model as a lighter option for casual backyard or target shooting. The package of Samick Polaris takedown recurve bow includes a B-50 Dacron String, but not contain any stringer with it. However, a stringer is a key to claim warranty as well as it will ease your job during stringing and unstringing the bow. So, during the purchase of a Polaris bow side by side, you should order a stringer too, which is not much costlier. The Polaris Recurve Archery Bow comes with different AMO size from 48’’ to 66’’. Depending on bow length the draw weights also vary from 15# to 40#. 48-inches extended bow with a 15# is a great combination for any youth, ten to eleven years old can draw it easily. However, 66’’ with 40# is a tough one for that youth, but easy for an adult with a long arm. For the average stature bowman 62’’ bow with 30 pounds or more draw weights, Samick is just stunning. The Samick Polaris is a perfect bow for both indoor and outdoor use. You will get accurate shooting by it and could maintain 1-inch groupings from 15 yards distance, and 1-1/2 inch groupings from 25 yards. That’s pretty impressive for such an economical recurve bow. 48, 54, 62 & 66 inch. In spite of economic bow, Samick includes all necessary things to start playing with it immediately after unboxing. It contains three-piece Takedown bow for easy transportation and storage, one camper sight or equivalent, one B-50 bowstring, one brass nocks, one finger tab, three Easton XX75 arrows and an arm-guard in its package. Q. Is it suitable for Hunting or beginner bow only? Ans. : As you know, the higher bow length 66’’ with 40# Polaris is suitable for hunting. However, that can handle an adult person only. Controlling such bow length in the woods is not an easy task for all, so Polaris is known as a low budget practice bow. Q. Is the Samick Polaris Recurve bow noisy? Ans. : The Samick Polaris takedown recurve bows a quieter bow than most of the budget bows available in the market. Top of that you use a silencer, it will be more silent. Q. What is the bow weight of Samick Polaris? Is it a heavier one? Ans. : the bow weight of Polaris Youth is not more than 3 pounds, which lighter even other Samick like Sage and Journey. Q. Does the Polaris Youth come with an ergonomic handle or not? Ans. : The handle of Polaris recurve archery bow designed very well, but a bit thicker which create discomfort for women or child during grip. Solution: Yes! It is true that Samick not consists of any stringer with it. You might know that it is an economic package of Samick Company. However, it is not costlier; you may easily collect it from the market. Moreover, also remember that it is necessary for stringing or unstringing a bow. Without assembling the bow with a stringer is prohibited and warranty will be void. Solution: In our, Polaris recurve bow review we said that it comes with several sizes from 48’’ to 66’’ bow length. So, during the order, you have the option to check your comfort zone and select the appropriate bow size accordingly. Samick present Sage with 62’’ bow length and a wide range of draw weights like 25 to 60 pounds with 5 pounds increments which are a bit higher than the Polaris. On the other hand, Polaris is a lighter bow than the sage 3.4 pounds. 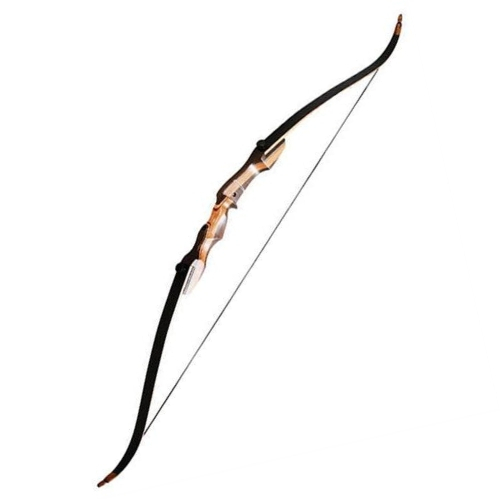 Polaris a kind of beginner bow only instead of sage support both indoor archery practice and outdoor shooting or hunting. Regarding quality, both the bow are same and Samick quality. The bow length of the Journey is 64-inches, the bow weights 3.4 lbs., and the draw weights of the Samick Journey is 30-60 pounds. You can easily understand that as compare Polaris is a bit lighter, but lower poundage bow then Journey. However, if you see the quality, accuracy, and the design, all created by maintaining the Samick standard. After considering all, the Samick Polaris 62 takedown recurve bow is fun to use as a beginner, or young adult’s as the first venture into archery. Many have started with a Samick Polaris, and they haven’t been disappointed by any of its landscapes: its looks, its presentations, or your daily use with it. It’s easy to string, simple to either take down or put back together and is both quiet and smooth in the field of archery. Hope you will love this economic bow once you start to use it.